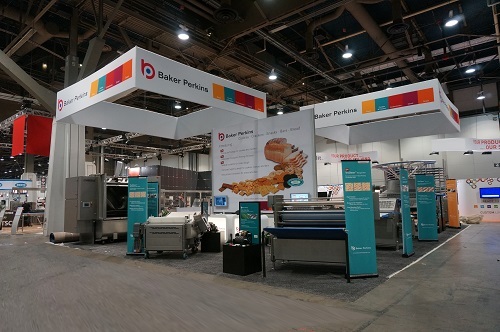 Precision dough forming equipment for high-output plant bakeries was exhibited by Baker Perkins at IBIE 2013. This high-tech system uses advanced process technology to achieve high-quality, high speed and low cost production in a dust-free environment. Bakeries are clean, products are premium-quality and consistent, production is non-stop and maintenance is easy. The Baker Perkins Accurist 2.1™ divider, conical rounder and Multitex4™ moulder, proven in bakeries throughout the world, are all designed to offer bakers improved product quality and process control through gentle dough handling - identified by bakery industry research into dough rheology to offer a clear path to product excellence and value. By creating a strong cell structure in the mixer and preserving it through the dividing, rounding and moulding phases through gentle handling, dough damage is reduced and end product quality more reliable. Volume, texture, color and softness are all better controlled while an increase in resilience leads to “better butter-ability” – an important benefit for consumers. Stronger dough means that bread quality is maintained with lower quality flour and/or reduced levels of expensive additives such as yeast, improvers and vital wheat gluten. Along with increased water absorption, this provides significant savings in ingredient costs. Accurate and maintained scaling reduces unit costs over extended periods while gentle rounding and moulding reduce jams and allow the machines to run for longer between cleaning. Carefully managing transfers and applying minimal pressure to the dough means that it does not stick to the processing surfaces so no flour dusting is required. Atmospheric dust that can be harmful to employees’ health is eliminated as is dust build up on the equipment. This eliminates the risk of cross-contamination, reduces cleaning and maintenance costs significantly, and extends the service life of the equipment. The Accurist2.1™ divider achieves the high levels of careful precision expected in a high-tech manufacturing environment. It delivers best-in-class weight control, low stress dough handling and low cost of ownership in high-output plant bakeries. Consistent Accurist™ scaling accuracy has set the industry standard for more than 20 years with more than 650 machines at work throughout the world. An outstanding Standard Deviation of just 0.09 to 0.12 ounces is maintained on 2 lb dough pieces over 10,000 hours of operation without replacing any machine parts. Depending on the number of pockets chosen, output can range from 840 to 14,400 pieces per hour; and piece weight from 6 ounces to 5 ½ lb. The gentle dough handling characteristics of the Multitex4™ moulder, proven in over 100 applications world-wide, provide significant cost-saving opportunities. The machine has been responsible for a step change in the quality of the final loaf wherever it has been installed through gentle dough handling and high-efficiency panning. The gentle action and tight coiling of the sheeting head result in a 10% increase in volume and cell count, which give an improved crumb structure and better colour. An increase in softness of up to 18% leads to a longer shelf life.